Yesterday, during a break in our Province meeting in Digby Stuart, Roehampton, I went out for a walk, stopping by the war memorial. Originally erected in 1918, it was renovated and moved to its current location in 1972. At some point names from World War II, the Korean War and a solitary death in the Boer War were added, along with tablets at each end from our convents in Armagh and St Charles Square. 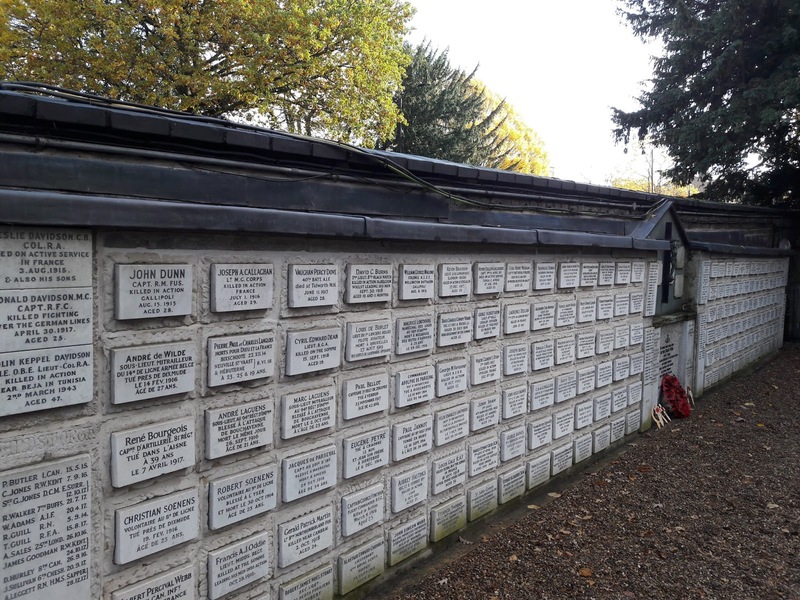 However, the majority of the plaques record beloved relatives of the religious and their pupils at the Convent of the Sacred Heart who died during World War I, plus a few army chaplains who may well have been personally known to members of the community. There are hundreds upon hundreds of war memorials up and down the country: in parish churches, village greens and town squares, and on the walls of universities and major railway stations. Erected after WWI, "the war to end all wars", within a few decades any surfaces originally left bare were used to record deaths from the next major war. 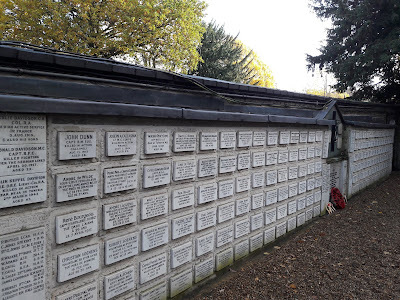 The names inscribed on them recall men who grew up in the same place, worked or studied together: the effect of so many names from this or that place, tells of a deep well of collective, localised grief and trauma we can barely begin to comprehend. In this respect, the Society's memorial is different, in that - with a few exceptions - there was nothing to bind the people on it to each other, other than their sister, daughter, aunt or niece in the Sacred Heart. In total, the main part of our memorial bears one hundred and sixty-eight plaques from WWI, each bearing a name, and maybe some moving details supplied by the family, such as a heart-rendingly young age (including a midshipman who was only 16 3/4). Interestingly, a few plaques also recall women; civilians who died either during their war work or as a result of grief and exhaustion. I do not know exactly how many girls and religious were at Roehampton at the time, but it was probably only a few hundred - certainly less than in many villages. And yet between them they lost one hundred and sixty-eight relatives - and probably several family friends as well, plus loved ones returning home seriously injured. (And for the community, the pain in October 1914 of Janet Stuart's untimely death, and the loss of so much promise) Those eleven metres testify to an unimaginable scale of loss and grief, to be repeated and deepened for some families in the next major war only twenty or so years later. remembering to work to prevent future remembrance days. May it be so, and a century on, may deep, regretful remembrance coupled with a growing awareness and understanding of the fundamental issues never cease, for us and for future generations.